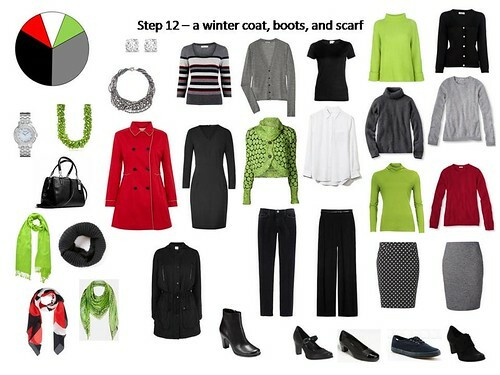 In the previous post, I left off at step 7, with enough garments and accessories to get through at least two weeks without completely repeating an outfit. I thought in this post I’d get through the rest of the steps but, umm… no. It will require at least one more post. It takes forever to find just the right picture, in just the right color, and just the right shape, to represent what I have in my wardrobe or want to add to it. Let’s just say that going through this exercise, I have gained a whole new appreciation for the work Janice does on The Vivienne Files. 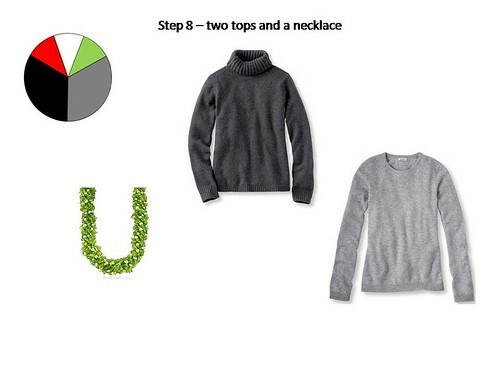 Anyway, moving on to step 8, we’re going to add two tops and a necklace. I chose a light gray cashmere jewel neck and a darker gray cotton blend turtleneck, both of which I already own. The necklace is my peridot torsade. 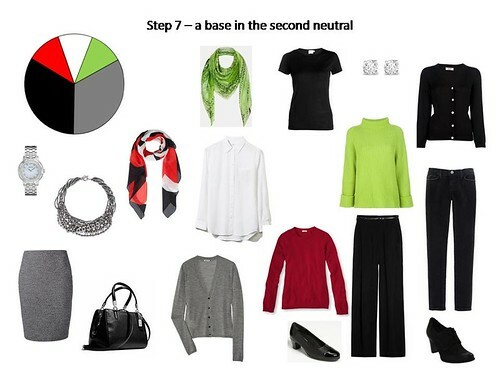 In step 9, we add a skirt with a top and shoes. In Janice’s lineup, this is the first skirt and fairly formal and the blouse is on the formal side as well. As in, “important occasion”. 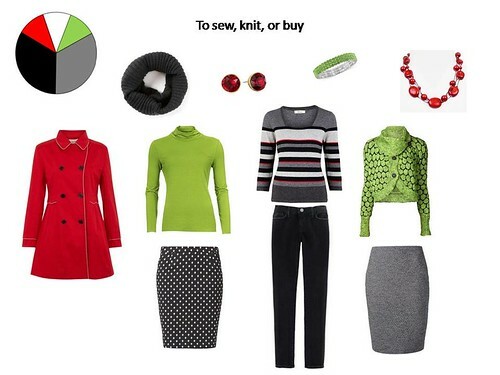 I already have a formal-enough gray skirt in this wardrobe and tops that work with it, so I’m going with polka dots and bright color. I’ll need to make both of these pieces (and my fall 6-PAC is starting to take shape). The shoes are a pair of Ecco maryjanes I already have. 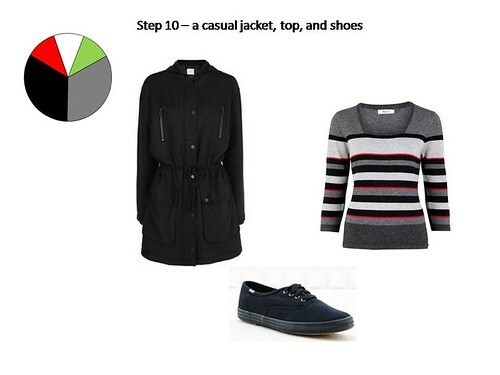 In step 10, the idea is to up the casual factor in the wardrobe and so we add a casual jacket, top, and shoes. I already have a black parka and a pair of black Keds. I’ll have to make the sweater (probably knit rather than sew). Step 11 is where we start adding personality to the wardrobe, although I think I might have started on that earlier with the polka dot skirt. Anyway, here we add a complete outfit – three pieces that work together. Some of Janice’s variations show a three-piece outfit, one shows three pieces that can be paired together in two different ways. I chose the latter and added a dress, a cardigan and a shawl. 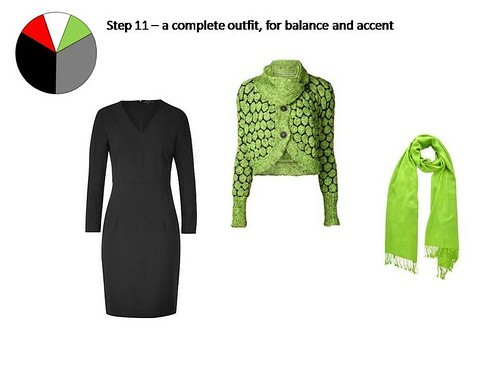 I wouldn’t wear the cardigan and the shawl together, but each works well with the dress. I already have the long-sleeved black dress and the green shawl. I’ll have to knit the cardigan. 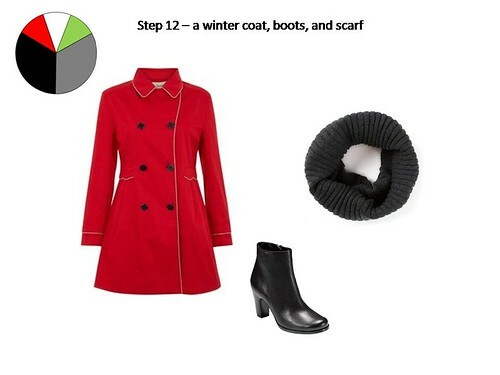 In step 12, we’re looking for an attractive, versatile winter coat. My 12-year-old black coat is getting threadbare and will require replacement soon so I chose this red double-breasted one because I like the shape and the details. When I make it, the trim will be black to match the buttons and it may have a hood so it’s more practical in rainy/snowy weather. The boots are my existing Ecco, and I’ll knit a black or dark gray cowl to keep my neck warm. Step 13 is round two of accessories. It calls for another handbag and because I don’t actually like to change handbags day-to-day, I chose to add a tote that already lives in my closet. It’s very useful for carrying larger items that don’t fit in the handbag. 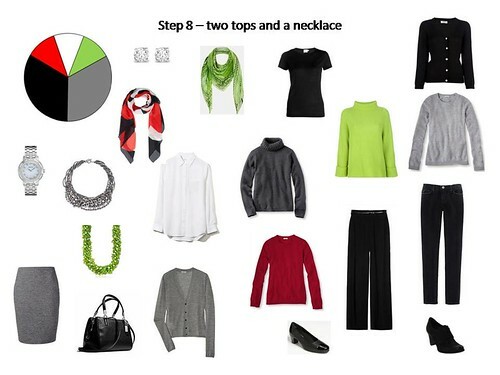 Then two pairs of earrings, a necklace, a brooch, and a bracelet. I’m not much of a bracelet person but I think I would wear this one. 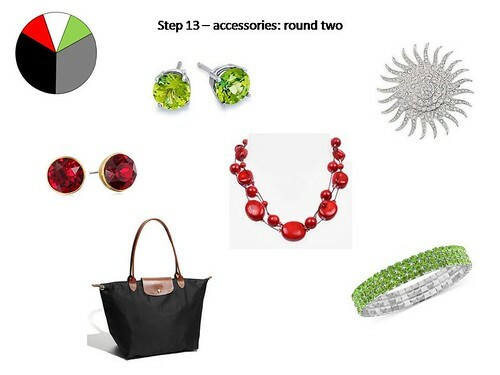 I already own the peridot earrings and the starburst brooch, and I’ll need to buy the red earrings and necklace, and the green bracelet. How are your wardrobe and/or sewing plans coming along? Please share in the comments. This is so beautiful – it makes my work on The Vivienne Files all feel worthwhile when I see the wonderful ideas you have! Thank you Janice for your kind words! Lovely wardrobe. Love the colors! This is so lovely to see Alexandra and it looks fantastic! Now find to find the time to do the same. Thank you Sharon! Please share when you do yours. I’d love to see. 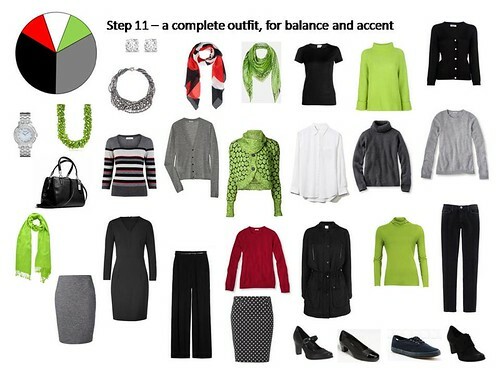 Can you suggest a knitting pattern source for the green and black cardigan?